Have you ever poured out more lotion than you actually wanted from a bottle? I know I have, but this new top has made things so much better. My Body Shop lotion, Moringa Milk, features a spray top that gives you just the right amount of lotion, in two squirts I have enough lotion ( I could probably just use one pump but I like my heavy hand ) to cover both of my hands. Here is a quick video to showcase the spray top. The lotion is priced at $16.00. P.S. This moringa milk is supposed to provide you with moisture for up to 12 hours. I love that phrase "UP TO 12 hours" which really means it can be as long as 12 hours or as short as 1 second. I know that this did not leave me moisturized for 12 hours but it is light and works for maybe 30 -45 minutes ( I guess around that time span). Ingredients include babassu oil and sesame oil. Sorry I am running short on time again today so I will visit all of your blogs later in the day and respond to your comments from yesterdays post. Whether it is our hair or our skin, we are constantly reminded of the importance of moisturizing. Although I have a few facial lotions that I love, I decided to try the Aveda brand moisturizer. Since the brand does so well for my hair, I wanted to let it loose on my face. I purchased the All Sensitive Moisturizer by Aveda for 33.00 (for the 5 oz bottle). I must report so far so good, my face is moisturized and it is not at all sticky or heavy on my face. Since I have combination skin this is the product the Aveda specialist suggested for me especially when I told her that my skin is sensitive. I love how light this moisturizer is on my skin, I only wish it included an spf. It includes grape seed oil and flower extracts along with some roots that I have not heard of before. Is anyone using a moisturizer that they made or one that is 100% natural? I will visit all of your blogs later today. Check out my video for the new Revlon Fantasy Lash mascara. It says on the package that this is a new product so I don't know why I think I remember seeing this is stores a while back. Anyway I think I say pretty much everything in the video but if you have more questions feel free to ask. Yesterday B spoke about mascara and primers! Do you usually wear a primer? Which brand? At Target I found this lovely eyeliner brush by Studio Tools for only $1.97. I know that some people have really expensive MAC brushes but if you don't have the money to afford those brushes, there is always a cheaper find out there. When I play around at home with different looks I use this brush and not a hair has come out yet. 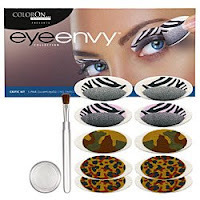 It is firm enough to apply the product but it is not too flimsy. 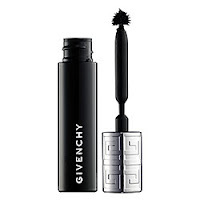 For someone just starting out with makeup this may be a good starter brush. Any cheap brands that you recommend? There are a few products that I have my eye on, some I will purchase and others I just want to bring to your attention. Sephora is now selling the Lash Stash. 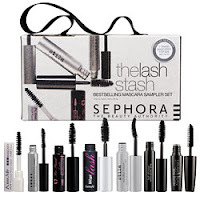 Seven mini mascaras from companies like Too Faced, Stilla, Smashbox are included in a kit for your sampling pleasure. Cost-$28. Coming SOON-Sephora has teamed up with OPI to bring beautiful nail polish shades to Sephora shelves. Which products do you have your eye on? My pure rose water finally arrived and I love it. I now mix it with the pure aloe vera juice and it is very moisturizing. The spray bottle on the left is filled with the aloe vera and the rose water is already in a spray bottle so I did not mix the two yet. Currently I will spray my hair with the aloe juice and then spray it with the rose water or vise versa. It can also be used as an astringent to cleanse the face (I have not tried this yet). I love how it has been making my hair feel the past few days so I will continue to buy it. 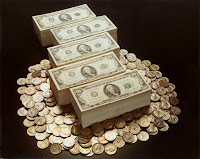 I am using the brand Kama Ayurveda which can be purchased online for $22.00. This particular brand of rose water is steam distilled which is done to purify the product. How do you use rose water? You know that if I like a product I need to get the largest bottle/tube available, so here is my large Dry Remedy Masque which I purchased yesterday for $35.00. I placed the two tubes side by side to give you a comparison shot. The larger tube is 8.5 ounces and the smaller version is only 4.2 oz for $26.00. I only wish Aveda would make an even larger Dry Remedy Masque. Oh and for those who did not read Brownee's response in my first Dry Remedy section, she is indeed correct that the Dry Remedy line is replacing the Sap Moss line. I spoke to an Aveda specialist yesterday and she said this new Dry line has more moisturizing properties than the sap moss line so this is an UPGRADE. I have been given an award, I know who would of thunk it? A woman babbling day in and day out about the products that I love and even those that I hate, actually walks away with an award. Amina has passed the honor on to me and I am so appreciative of this award. I literally started this blog last December but had no idea that a portion of my vision would come to fruition so quickly. To be acknowledged for doing something that I really enjoy is so rewarding. Thank you Amina and the other bloggers and all of the readers who support this site. This also includes the many LURKERS who stop by daily but never comment...lol one day I am going to have a post that will draw you out and motivate you to comment....hopefully. Frugalista of the Frugalista Files- You are truly a talented journalist who manages to stomach my typos in support of a fellow blogger. (I’m usually posting as I am running out of the house so please follow Frugalista and cut me some slack..lol)She rocks on so many levels that I can't even begin to expound on it in this post. She also constantly reminds me through her posts to remain frugal especially in this economy. -thanks Frugalista!!!! Antithesis- Antithesis has been here early on my blog life, always supportive and kind. She is an intelligent young lady who has vision beyond her years. I just never know what I am going to get when I go to your blog and I LOVE that....thanks. Brown Girl Gumbo- What would I do without my Friday photos? Your posts are always so thorough and entertaining. You support so many in the blogging world, I have visited some lost pages deep down in blog land and who has already left a comment? You guessed it, Brown Girl Gumbo..lol Keep up the great work and I look forward everything that you have in store. Dominican Enigma You know you rock the best contests. I really like what you are doing on your blog and thanks for always checking out my posts. Many of the people I wanted to honor already received this award and still I just couldn't fit everyone in so I have an honorable mention for Don who no longer blogs but was very supportive. B I read that you won this already but I thought I would shout you out anyway along with another winner JustMe. I also need to shout out my longtime supporters Celebrity Fried Rice ,Jewells, Travel Diva , non bloggers Bellefille &Moon also Brownee who isn't a blogger but who reads OCCASIONALLY..lol and so many others. I'm so sorry if I forgot you but you know I really appreciate you all. thanks for the support. *Please read the post below because it is a new and interesting product review. Last week I attempted the Master Cleanse program but I failed. I know that people usually refer to this process as the Master Cleanse diet (or lemonade diet), but in reality it is a way to cleanse your body of toxins etc. and as a result people do lose weight. This cleansing involves drinking a lemonade-like concoction which will rid your body of impurities as you shrink your waistline. The Master Cleanse has been around for many years and has continued to gain popularity as Beyonce and other celebrities use this program. Here is a link if you would like to see the recipe or learn more about the Master Cleanse. I must say that although I failed at the cleansing program last week I didn't eat bad foods, I actually indulged in fruits and some veggies, (a little meat too). This week I am going to up my fruit and water intake and reduce the amount of meat that I will eat for the week. Have you tried the Master Cleanse program? Do you detoxify your body to remain healthy? I remember as a kid trying to slather as much aloe vera on my hair as possible once a dear family friend, whose hair is GORGEOUS, told me that she uses it on her hair. As the years passed by I moved on to other ingredients and products but recently I have been reminded of the many benefits of aloe vera from posts by Tracyee and Antithesis. Tracyee created her own moisturizing spray out of aloe vera and other ingredients( you will find the recipie when you click the link). I wanted to try out her spray but my rose water did not arrive yet so I decided to play around with the aloe vera liquid. Indeed my hair was moisturized when I applied it to my hair. After putting some of the aloe vera in a spray bottle I added a tiny bit of water and sprayed it on my scalp and hair. On some days I mixed it with other moisturizers that I like, and my hair felt wonderful for days. I am thrilled that I am back to using this natural ingredient on my hair. Aloe vera contains an enzyme that is necessary for the production of new hair. If you read Tracyee's post, you will find out many other benefits of using aloe vera. I purchase George's Aloe Vera which is 100% fractionally distilled aloe vera. Adults can also drink their way to health by drinking 2 ounces twice daily. The particular brand that I selected is bitter free and has no preservatives or additives. Another positive note for George's aloe vera is that it does not have to be refrigerated. Apparently all aloe vera is not the same and when the people behind George's aloe vera went to Mexico they noticed that the roadrunner bird would only drink from a certain type of aloe vera so that is what they used to make this bottled version. Are you using pure aloe vera for your hair ? Please share your recipes. When I was younger I had two really good friends and one demanded to know which one I considered to be my best friend. Simply telling her that they were both on equal ground was not a satisfactory response, she wanted me to make a decision. In her mind I just had to select one or the other there wasn't enough room for both of them to function as my "go to pal". I have recently encountered a similar situation with my hair products. I was moving through life just fine using my Aveda Damage Remedy line. My hair was soft, shiny, and bouncy I didn't have to make a single decision I love the products because they work for me. Then one morning I received an enticing email that listed the benefits of Aveda's new Dry Remedy line. Since I'm a gal whose hair can turn into hay as quickly as you can say the word "brittle" I was intrigued. I purchased the Dry Remedy treatment but was later given the opportunity to try the Dry shampoo and conditioner as well. After using the entire Dry remedy line, which promises to quench the thirst of the driest hair, I was sold. Just like the damage remedy line my hair was shiny, bouncy and soft so I had a decision to make. Which line would become my "go to hair revival system"? It has been three days since I used the Dry line and my hair is still shining. My sister saw my hair and asked for the name of the product that I used to make my hair shine. After informing her that I only used the Dry remedy line, the tubes were hauled off to the bathroom and she too emerged with brilliantly shiny and soft hair. I am now torn because I can't wash my hair with two lines at the same time but perhaps I can alternate between the Dry and Damaged lines so as not to neglect either product. Do you plan on trying this line? What is your solution for dry hair? *The Dry Remedy line just launched in stores this week so you can make your in store purchase now or you can order it online. You are trying to live a healthy lifestyle so you cut an apple as you plan to indulge in only the healthiest of treats when your phone rings. Once you return to your apple, (depending on how long you were on the phone of course) it's brown! What gives? Depending on the amount of oxygen in the air and the object that it interacts with you will get oxidation, causing your once delectable apple to turn an unsightly brown color. If you leave the apple out longer, it will continue to brown and shrivel up. The molecules are going at it on the apple but what we see, the brown color, is a result of the free radicals. Free radicals are the unstable molecules that break free and cause major damage. That’s fine for an apple but what if this happens to your face, not so cute right? Free radicals are responsible for aging and once they are on the loose the can do much damage to our faces and bodies. Free radicals have an uneven number of electrons so they are unstable. These crazy radicals push through your body in search of molecules to bond with in an attempt to become stable. So once they get to bond with another molecule all is well right? Not quite these radicals are bad news because they only bring the other molecules down. Our body will try to help us by fighting against free radicals through the antioxidants that we can get from blueberries, as well as other fruits and veggies. Vitamins E, C and A do a wonderful job at fighting against these radical nuisances, they do their best to keep our healthy tissues healthy. So while I am eating what I need to eat in order to keep aging in check, I will go the extra mile by using a high concentration of vitamin C daily. 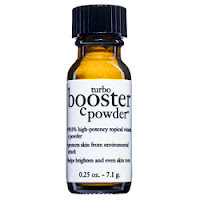 The product I bring you today is the $35 Turbo Booster C Powder by Philosophy. Watch the video for more info. We all know that we are going to age, but what is your trick in preventing premature aging? Not beauty related but this is a movie that I NEED to see this Fall. The new Tyler Perry flick, The Family That Preys, is jam packed with acting heavy weights. For those who dislike the Madea character, it does not look like she will make an appearance in this movie. Which Tyler Perry movie is your favorite? Not too long ago I posted on the sunscreen that I like to use but I have recently found another great sunscreen. Although I was very satisfied with the suncreen I mentioned in my original post, I was looking for something sold locally at a regular drugstore instead of always turning to Sephora. I found the Aveeno Continuous Protection Sunblock Spray with spf 45. This can be used on your body and face but if you use it on your face you are directed to spray it on your hands and then rub it on your face. The Aveeno sunblock will coat your skin with a lovely sheen. I like that this product comes in a spray can for easy application. It is available at CVS, Rite Aid, Target and similar stores. I purchased the spf 45 for 6.50 but I have recently seen another Aveeno sunblock with spf 70 which costs 10.00 at the aforementioned stores. Please everyone use your sunblock this summer. Which eyeliner is your favorite? This week at Target you will find the 18 oz Caress body wash on sale - 2 for $6. I also purchased the twin pack 18 oz Caress Tahitian Renewal body wash for $8.40. It also came with a trail size 1.86 oz Caress Exotic Oil Infusion body wash.
Have you seen any good sales this week? Nine West shoes on sale $22. Old Navy flips missed that $1 sale so $5 for both. From my sister from payless -no price tag but I like them. American Eagle peep toe shoes also from my sister from Payless - I really like these very very comfy. Have you gone shoe shopping yet? I haven't done a "product watch" post recently but this is the section where I talk about products I am looking out for or new items I have ordered recently. 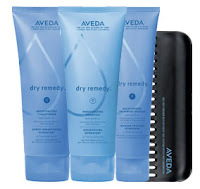 By now you have probably seen the new line from Aveda, Dry Remedy. I did not purchase the entire line just the treatment, so I will see if it is as good as Aveda claims it is. I step away from the Mac website and before I know it they have new collections. From the Electro Flash line I like the lipsticks in Vanity's Child and Dangerously Hot and Li Hot Pepper for the lipglass. However, I doubt I will purchase anything since all of the colors look like other items in other collections. Are you ordering anything new from MAC? Do you have your eye on any products? I have always wanted a really quick and easy way to apply nail polish, not that it is a difficult process now but I just wanted something different. I hated carrying the bottle around and I needed something that wouldn't crack if I dropped it on the floor. So when I first saw the Sally Hansen nail pen I was ecstatic, but as I described it in my earlier blog post it was like applying glue to my nails. Although the concept was good the product was horrible, it was totally useless so I threw it away. When I learned that the makers of OPI were coming out with the same type of product through their line called Nicole I was excited because I like OPI polish and I was expecting good quality. I saw the Nicole pen polish at Target yesterday so watch the video for my review. They only had blue left in stock so that may give you an indication of how well this baby works. I am so happy because I knew a company would get it right. Have you ever tried a similar product? Which brand and how did it work? My product review will come later this afternoon. Now that the weather is so warm we really need protect our hair. If you are a sun bunny you may notice that the such can dry out your hair, leaving it dull. Moisturize your hair properly before going out in the sun. I will soon complete a post on moisturizing your hair but for now I wanted to address the issue of dry dull hair. You already know that I like Aveda especially the damage remedy line so I wanted to try the Aveda brilliant emollient finishing gloss. This gloss can be used on dry or wet hair. 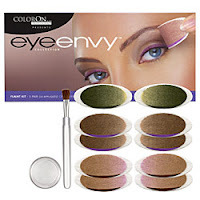 This product is VERY light and not at all sticky so that I love. It also gives off great shine but the problem is that the shine does not last long enough. 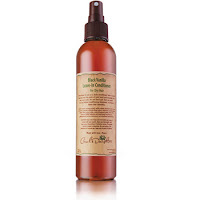 It is a paraben free product and it is made from rice bran oil, jojoba oil and soybean oil. The shine doesn't last as long as I would like. I tried applying the product to my wet hair and after it has air dried, the next day it is dull looking again. not completely dull but not as shiny as it should be. When I applied the product to my dry hair the shininess lasted for an even shorter period. Priced at $24.50 you will get 2.5 ounces. Here is my hair before the Aveda gloss (left) and the after shot taken on the right side is the result of two pumps of the gloss. How are you protecting your hair during these warm summer months? I am sure you have been there before, the point where you realize you no longer like a product that you once enjoyed. My latest "I don't like you anymore" product is Carol's Daughter Black vanilla Leave-In Conditioner for Dry Hair. I do like that this conditioner is a liquid in a spray bottle so it goes on with a few simple squirts. Those who like the scent of vanilla will be happy with this hair product that promises to give you shine, the ability to detangle and moisturize your hair. This product did not shine my hair at all but I ignored that because of the great ingredients like nettle, sage and rosemary. It didn't moisturize my hair much either because my hair would become dry again not long after I had sprayed on this product. It was good at detangling my hair when it was wet so I used it mainly as a detangler. This product costs $11.50 for 8 counce but I would not make this purchase again. I know some people love this product and that is great but for me it didn't work well enough to motivate me to buy this again. However, it isn't a horrible product and the ingredients rock so I won't throw it in the skip it files. What is your favorite Carol's Daughter hair product? How did it work for you? If you have never tried anything from the line is there a product you have been thinking about purchasing from the line? I will be away for most of the day again but I will check out your great blogs later and respond to your comments from yesterdays post. Thanks so much for reading I appreciate you all. Please tell me what you would like to see more of on this site.